At our foundry in Sörup we create iron alloys precisely tailored to customer needs. Casting ladles transport the liquid cast iron to centrifugal casting machines specially designed and manufactured by us. Here the liquid cast iron is formed into the cast blank using centrifugal force closely observing various parameters such as time and rotational speed, cooling, mould material or geometry. The result is a homogeneous blank with a very fine material structure. On the other hand, it possesses significantly higher key mechanical and technological properties compared to conventional static casting. This combination allows many advanced applications. Using centrifugal composite/bimetallic casting, these blanks can even combine the advantages of two different materials in one component. After cooling, the castings will be individually machined. Our experienced staff uses a variety of state-of-the-art lathes, milling and drilling centres, as well as honing and annealing systems. 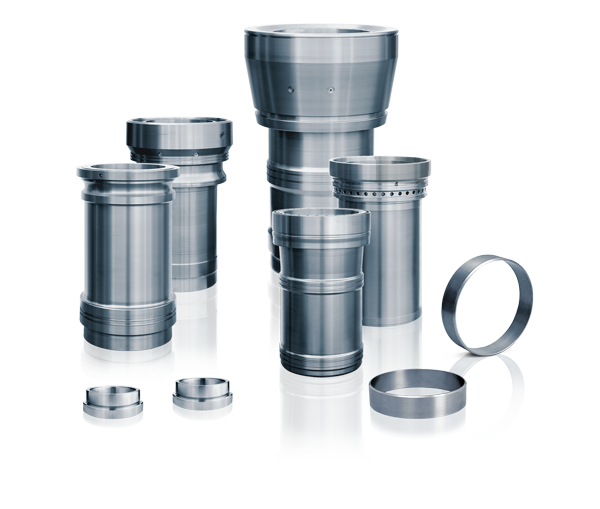 They comply with the highest quality standards of dimensional accuracy, geometric dimensioning and tolerancing, as well as surface finish.